Red vs. Blue: Who makes the better 16-core CPU? There's only one way to find out. Who makes the best 16-core CPU? 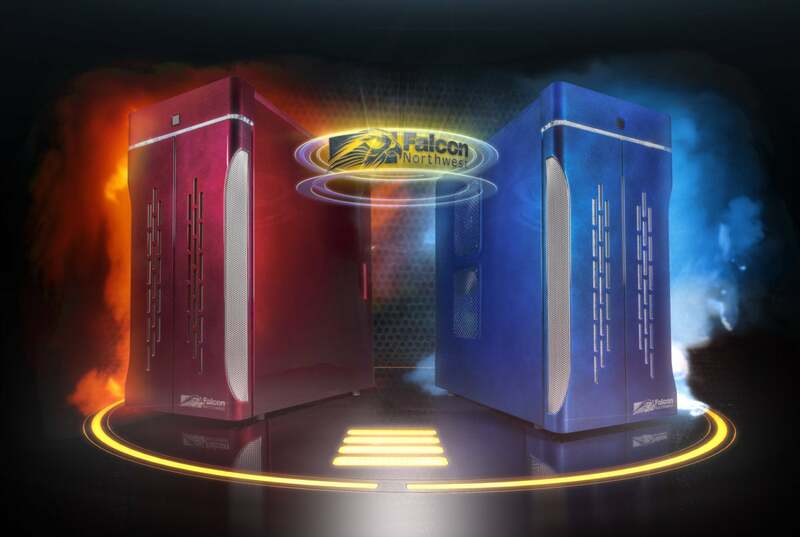 Now that AMD has its 16-core Ryzen Threadripper 1950X and Intel has its 16-core Core i9-7960X, we had a chance to find out when boutique custom PC builder Falcon Northwest built a pair of nearly-identical rigs that could truly go head to head. Both feature the same 1,000-watt EVGA Super Nova G3 PSU and the same custom closed-loop cooler system. The number and type of system fans are the same as well. 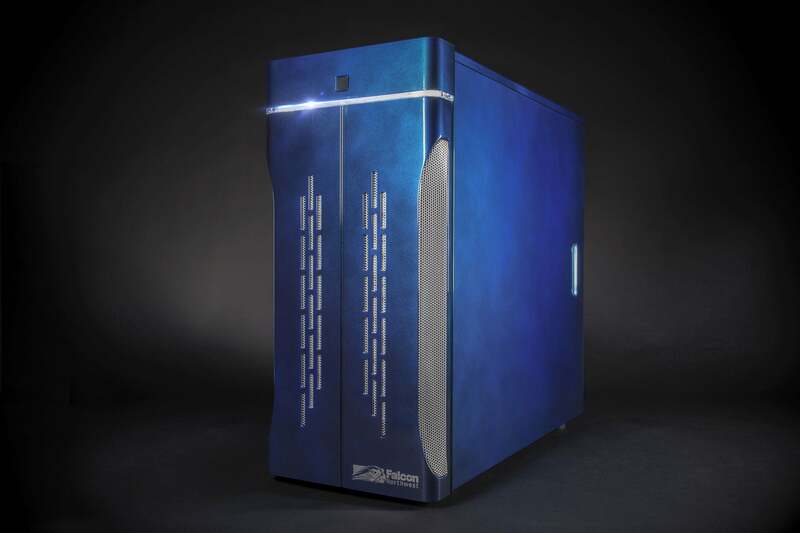 This Falcon Northwest Talon features a 16-core Threadripper 1950X, 128GB of RAM, and pair of Titan Xp graphics cards. The paint job is called Red Clouds. Although both have the same storage subsystem, there is a slight variance. The pair of Samsung 960 Pro NVMe SSDs in the Intel system are configured as PCIe devices in RAID 0, while the AMD box keeps both Samsung 960 Pro drives as separate drives. We settled for this variance so as not to hobble the Intel box. 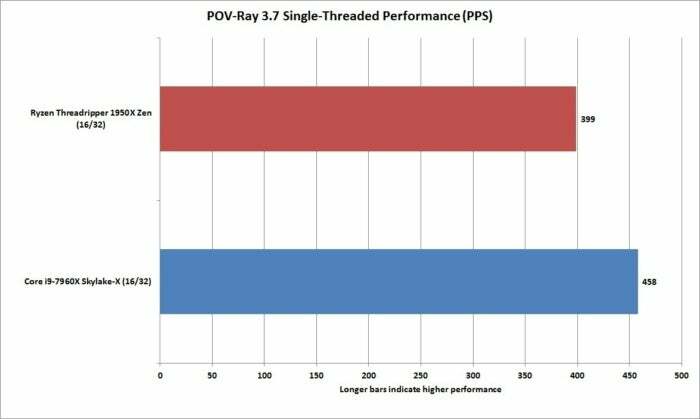 After all, at the time we requested the machines in early September, RAID 0 using NVMe drives was available only on the Intel platform (not VROC, but using the X299 chipset) not on AMD's X399. Since then, AMD has introduced support for NVMe RAID. Looking at the read and write performance of both machines, the difference doesn't seem to matter much. The Intel system has somewhat higher read speeds, while the AMD system has somewhat higher write speeds. We matched carefully in most other areas. Both CPUs are kept bone stock. At the time of our story, Falcon had qualified 128GB of RAM up to DDR4/3000 speeds for the Intel system, while the highest-clocked RAM on the Threadripper system when using 8 DIMMS was DDR4/2400. We decided to keep both machines at DDR4/2400 to match in price as well as capability. Other than the CPU and motherboard, the only other big difference is the color. 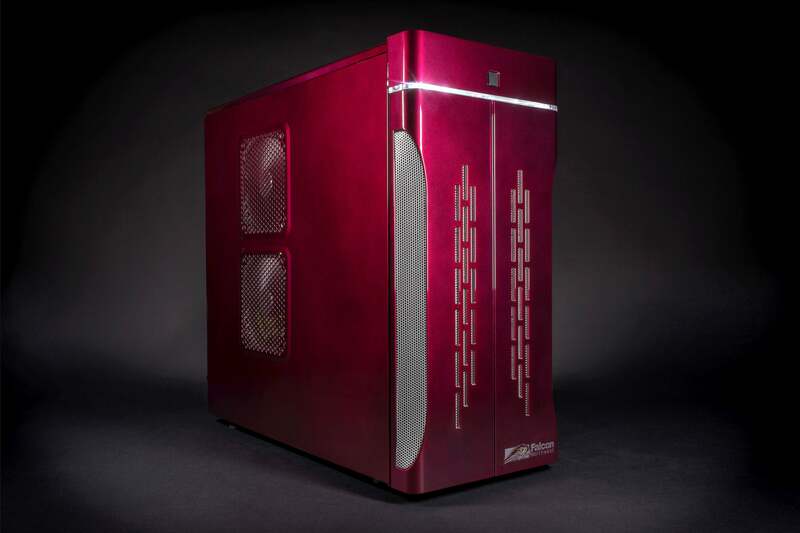 The AMD machine is hand-painted in luscious Red Clouds, while the Intel machine is hand-painted in the striking Cobalt Clouds. This Falcon Northwest Talon features a 16-core Core i9-7960X, 128GB of RAM, and a pair of Titan Xp graphics card. The paint job is called Cobalt Clouds. First up is Maxon's Cinebench R15 test. It's a free benchmark based on the rendering engine Maxon uses in its professional Cinema4D app. It's highly multi-threaded and almost entirely a CPU-focused test (though there is a graphics test, too). The default mode is to test all of the cores at once. The Core i9 squeaks by the Threadripper box by a few percentage points. Our first test is CineBench R15, where the 16-core Core i9-7960X has a very small advantage. 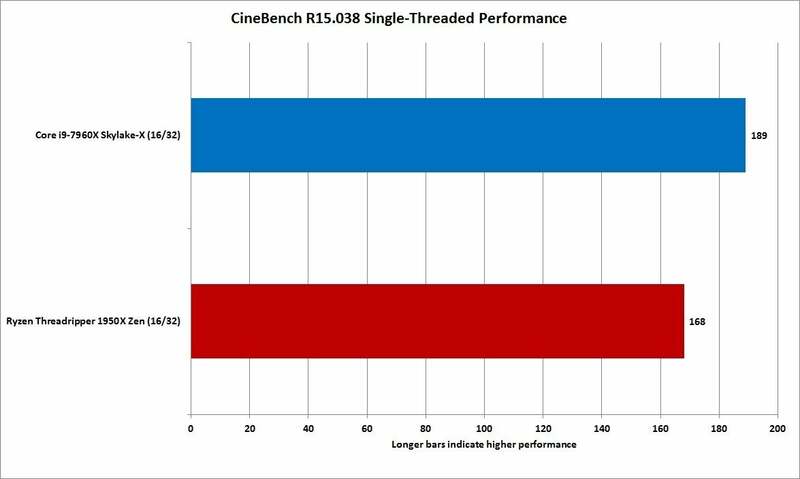 Cinebench R15 also allows you to tweak the number of threads to test, so we ran it on only a single core. 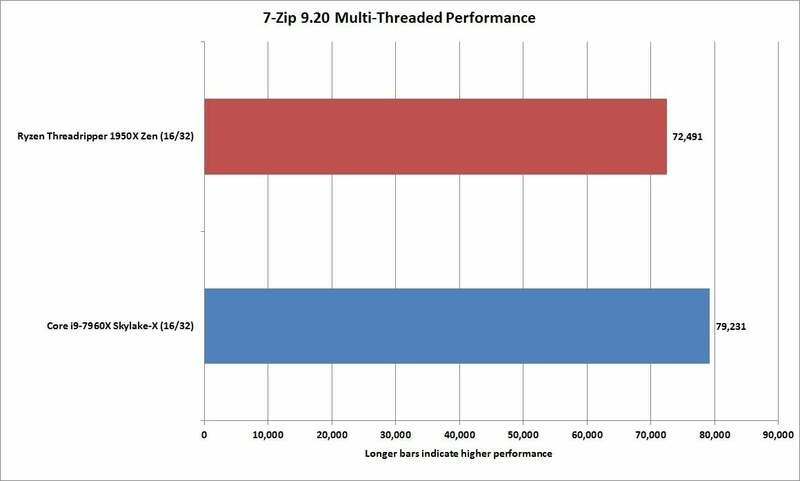 This is where Intel has had an advantage over Zen-based chips, and it shows with the Core i9's 15-percent lead on single-threaded tasks. We'll dive into just where Intel gets this advantage later, but anyone who thinks this isn't a big win for the 16-core Core i9 is in denial. 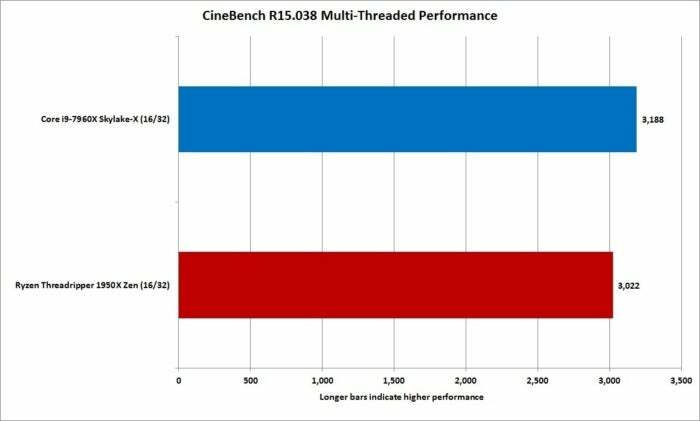 Cinebench R15 on light loads gives the Intel chip the nod. The Persistence of Vision Raytracer is an app that literally goes back to the days of the Commodore Amiga. Obviously converted to run on modern hardware, the free ray tracer loves CPU cores and threads. As we saw with Cinebench, the Core i9 has a slight edge in performance. 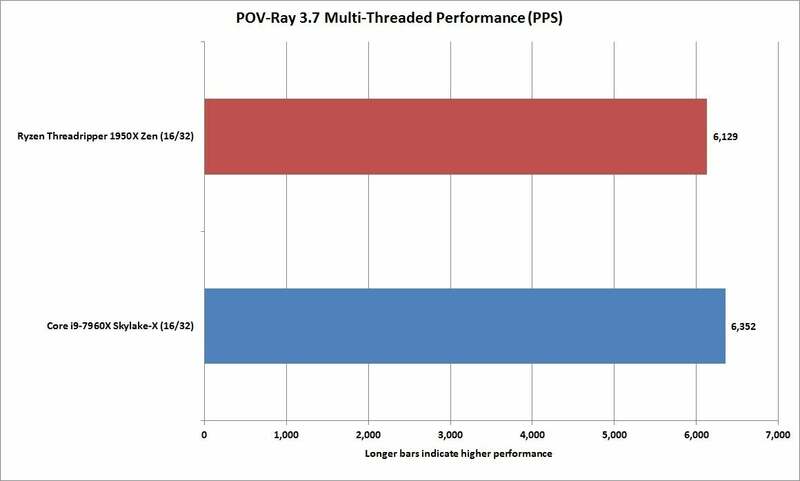 POV-Ray also supports running in single-threaded mode. As with Cinebench, we see a very clear advantage go to the Core i9, mostly due to the clock speed advantage the Intel chip holds. (We'll get into just how much of a clock speed advantage that is later on.) There's no denying that on lightly threaded loads, Core i9 has the advantage. Blender is an open-source 3D modeler that sees a lot of use by independent movie makers for effects sequences. Even NASA uses Blender these days to produce 3D models. Blender was also the benchmark of choice AMD used when it first unveiled its Zen CPU last year. So who leads the way here? 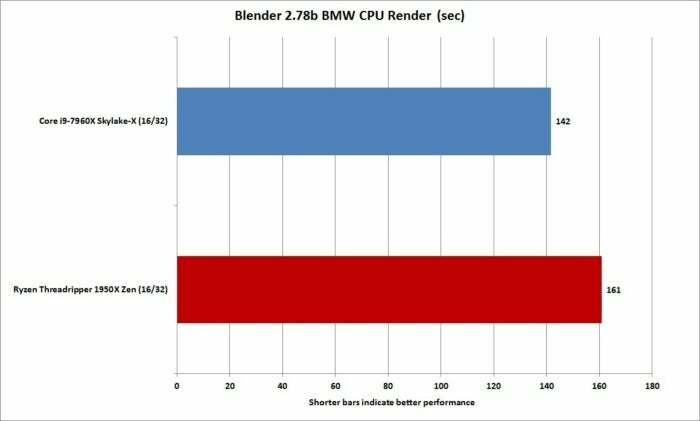 In the chart below (showing Blender using the BMW benchmark), lower scores are better in rendering, and the Core i9 has a double-digit lead over the Threadripper part. Ouch. Using the popular BMW benchark load in Blender, The Core i9 has a small advantage over Threadripper. 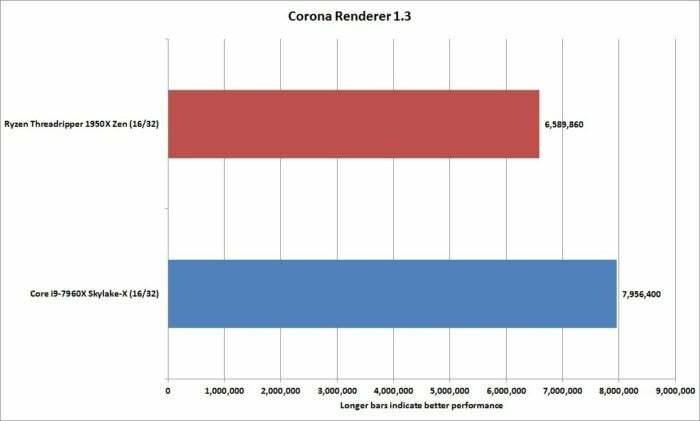 Corona Renderer was first introduced with AMD's Threadripper, and it was used to soundly trounce Intel's 10-core Core i9-7900X chip because 16 > 10. When it's 16-on-16, though, things go a little sideways. Where Cinebench and POV-Ray put the two CPUs fairly close, Corona Renderer 1.3 puts the Threadripper about 19 percent slower than the Core i9. Ouch again. Benchmarks can be easily become political footballs, with one side's fans claiming a test is cooked to favor the other. Let's remind everyone that it was AMD who recommended the Corona Renderer test. AMD showcased the Corona Benchmark for the Threadripper launch, but in a matched 16-core vs. 16-core battle, the Ryzen loses. Moving on to a compression test, we use the popular and free 7-Zip to measure how fast each machine is at handling file compression. Using the internal benchmark, the Core i9 is about 9 percent faster. 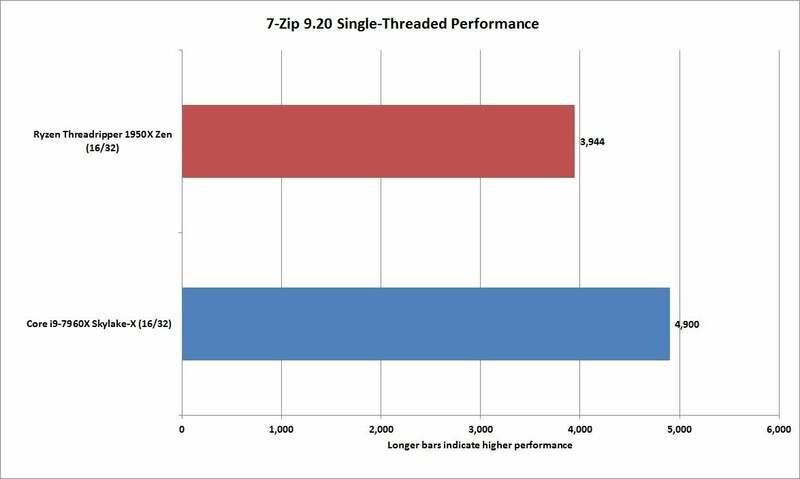 7-Zip on multi-threaded tests has both CPUs fairly close in performance. 7-Zip also features a single-threaded test, the results of which are no surprise: The Core i9 comes out about 21 percent faster than the Threadripper part. Again, this is likely due to the clock speed advantage of the Intel chip over its AMD counterpart. In single-threaded tasks, the advantage Core i9 has over Threadripper is much clearer. For encoding, we ran our standard test, which tasks the free Handbrake encoder with converting a 30GB 1080p MKV file using the Android Tablet preset. 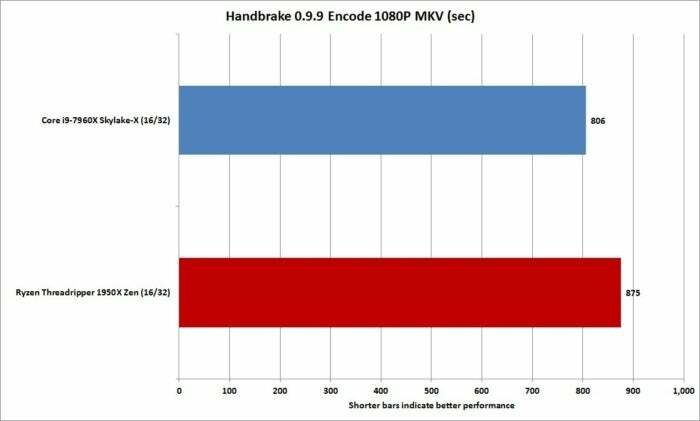 Like most encoders, Handbrake favors having more cores, and we see the two chips in the same neighborhood at least. The Core i9 still comes out ahead by 8 percent, but at least it isn't the blowout we saw in Corona or Blender. For our encoding test, we tasked each machine with converting a 30GB 1080p MKV file using Handbrake. Yes, yes, but how do they game? Keep reading to find out.